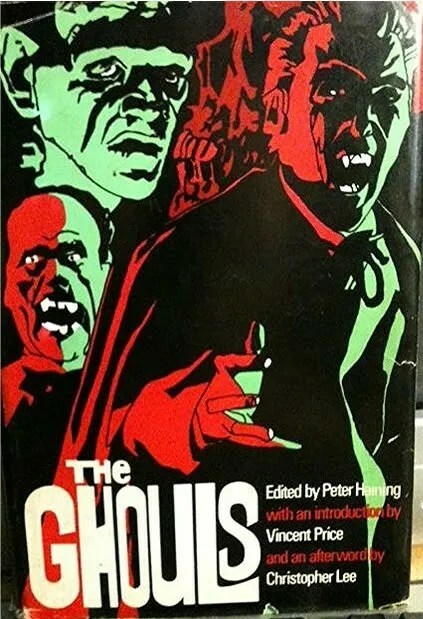 They pulled out all the stops on this one: Introduction by Vincent Price, Afterword by Christopher Lee, Dedication to Boris Karloff, quote from Alfred Hitchcock leading into the Editor’s Foreword, all designed with the “classic horror movie fan” in mind. This is only partly true. You would be hard-pressed, for example, to find anyone who considers Monster of Terror (1965, known in the United States as Die, Monster, Die) a good movie, much less a great movie. It’s based on a story called “The Colour Out of Space” by that paranoid old recluse H. P. Lovecraft. You can read more about the film at Scott Ashlin’s blog, 1000 Misspent Hours and Counting. I’ve become a big fan of Nikolai Gogol, but I had forgotten that the classic Italian horror film Black Sunday (1960), starring Barbara Steele, was inspired by Gogol’s short story, The Viy. The movie, directed by Maria Bava, has almost nothing to do with Gogol’s story, but both film and story are classics in their own way. I didn’t like the beginning Nathaniel Hawthorne’s “Feathertop,” on which the movie Puritan Passions (1923) is based, because it starts out too cutesy, like a whimsical fairy tale, with a witch lighting her pipe by magic. But actually, there is a great scene later in the story. The witch has brought a scarecrow to life. The scarecrow, whose name is Feathertop, appears human to everyone who looks at him, but there is a scene in which he is courting a young lady, and he looks in the mirror and sees himself as he really is – a scarecrow – and I thought it was quite a chilling scene. I haven’t seen the movie so I don’t know how the filmmakers handled it. “The Magician” (1908), by Somerset Maugham, is one of my favorite stories in the book. It’s a simple story involving a young lady who meets a “dabbler in the Black Arts” named Oliver Haddo (the character was based on real-life occultist Aleister Crowley). The bulk of the story is filled with richly atmospheric hallucinatory imagery and I can see why Metro-Goldwyn-Mayer wanted to bring it to the silver screen in 1926. Unfortunately, this seems to be lost film. There is documentation that the movie was made, but no prints have been found. At this point, I would like to turn the report over to Mark Hodgson of Black Hole Reviews. Enjoy.